In this adapted excerpt from chapter 3 of my MPC Logic tutorial book, ‘Using Logic Pro With The Akai MPC‘, I’ll take an initial look at MIDI Clock sync with Logic as the ‘master’. 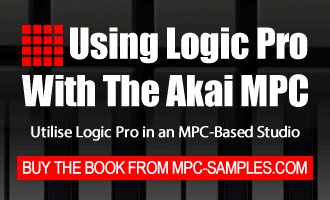 This full book covers everything you need to know about using any hardware Akai MPC successfully with Logic Pro (and Logic Express), from initial hardware and software set up, to using Logic as a sound module for your MPC, syncing your MPC with Logic using MIDI Clock and MIDI Time Code, and tracking both MIDI and Audio data into Logic ready for a professional mixdown. To buy and instantly download the complete 116 page book with all the project files you need to recreate all the tutorials in both your MPC and Logic, head over to my site MPC-Samples.com. As we saw in chapter 2, Logic can be a valuable sonic resource for beats and songs written within an MPC, working as a ‘sound module’ that can provide quality sounds triggered by MPC MIDI events. The idea here was that your entire beat is written and played back within an MPC. Taking this idea a little further, you could also use your MPC to ‘trigger’ other sonic resources from Logic. Remember, Logic is a complete digital audio workstation (DAW), so is also able to record complex MIDI sequences and even complete audio performances. These Logic sequences and audio tracks can also be ‘triggered’ by your MPC when required. So for example, you’ve written a cool beat in your MPC, but it needs some scratching. You could record your scratching onto a Logic audio track and as you continue to work on your beat within your MPC, you can have Logic automatically play this scratching back in perfect synchronisation each and every time you hit ‘PLAY’ in your MPC. And when it becomes time to create a polished stereo master of your beat, Logic is ready to show you its true power, as you can transfer everything from your MPC into Logic, either as MIDI information or as pure audio. Once completely transferred into the Logic environment, we can then apply further processing, effects, edits and other essential mixing techniques to create a polished, professional master. In order to perform many of these tasks, we must ‘synchronize’ the MPC with Logic. We do this using the MIDI protocols we mentioned in chapter 1 – MIDI Beat Clock and MIDI Time Code (MTC). These MIDI protocols continually send MIDI instructions from one machine to the other, ensuring that both machines retain a tight sync with each other. There are two MIDI syncing protocols used by Logic – MIDI Clock and Midi Time Code (MTC). MIDI Clock is a signal that represents the current tempo of the music, but contains no time or location information. It can be used to keep two MIDI devices synchronised, and can also allow the ‘master’ device to start and stop the ‘slave’ device. Midi Time Code is a signal that continually tells the slave device what time and location the master device is currently at. When syncing via MIDI, we have to assign one machine as the ‘master’; this machine will send out all sync information, including tempo, time code, and transport control data (i.e. stop, play, forward, back etc). The machine receiving these commands is referred to as the ‘slave’. In this book, we will be providing examples where the MPC is either master or slave depending on the specific requirements of the task. Let’s dive in – and don’t worry, MIDI sync is actually really simple to set up! First, you’ll need a beat sequence loaded into your MPC – in the full book I use the ongoing project for this example, but in this adapted version, I’ll provide you with a simpler version to cover specifically everything covered in this free tutorial. Locate the ‘MPC Files’ folder from the tutorial files download and locate the folder suitable for your MPC model. If you have an MPC1000 or newer, load up the LOGIC.prj project file. MPC4000 owners should load up ‘Multi 1.AKM‘, while anyone running an older MPC need to load up the LOGIC.APS and LOGIC.ALL files. Once loaded, select sequence 1, which is just a drum beat with a tempo of 80 BPM – press PLAY START to hear it. Now in Logic, open up ‘MIDI Clock Sync.logic’. This project contains three Logic Software instrument tracks all containing pre-recorded MIDI data, with a session tempo set to 80 BPM to match that of our MPC sequence. The first example will be for MIDI Clock as this is the only MIDI sync protocol available in all MPCs. MIDI Clock is a syncing protocol present in all MPCs. It is a signal that continually tells the ‘device the current tempo of the ‘master’ device. When syncing via MIDI clock, all MPCs can be either the ‘master’ or ‘slave’ device. However, Logic can only be a MIDI Clock ‘master’ – hence in this example, we’ll be using Logic to control the playback of your MPC. Hence when you press ‘record and play’ in Logic, the MPC begins to play back as well, and at the same tempo as Logic This means that in theory, there’s no need to worry about the tempo in your MPC, as it will be overridden by Logic. Firstly, be aware that in order for Logic to control the MPC, the MPC must be able to receive MIDI instructions from Logic. This means we need to have a MIDI cable going from Logic’s MIDI OUT to the MPC MIDI IN. This should already be set up as per the instructions within chapter 1 (as part of the ‘MIDI handshake’ which I also cover here on MPC-Tutor.com). If this is not set up, make sure you now connect a MIDI cable from your audio/MIDI interface’s main MIDI OUT to your MPC’s MIDI IN 1. Here, make sure ‘Transmit MIDI Clock’ to ‘Destination 1’ is checked. In the ‘Destination 1’ select box, you can either choose ‘All’, or choose the specific MIDI port you wish it to be sent via, either setting will work. How do I make my MPC MIDI IN port appear here?! As mentioned previously in chapter 1, Logic will reference all MIDI ports in relation to your audio/MIDI interface, so by default, you’ll most likely see something like ‘Edirol FA66 Plug 1’ – i.e. ‘Send MIDI Clock out of Edirol MIDI Port 1’. That’s fine, and it will work perfectly well. However, if you wish to see everything in terms of MPC MIDI Ports, you can first set up your MPC as an official MIDI device using the built in Mac OSX app ‘MIDI Studio Setup’. In this software, you ‘add’ your MPC as a device and then graphically configure all MIDI connections. The end result is that Logic will actually reference any MIDI connections from the perspective of your MPC, as in the screen shot above – ‘MPC2500 1’, which effectively means ‘send MIDI Clock to MPC2500 MIDI IN port 1’. You can learn how to do this in the bonus chapter at the end of the book, but just be aware that this is purely optional. Finally, at the foot of this page, make sure that ‘Transmit MMC’ is checked. MMC stands for ‘MIDI Machine Control’ – this sends ‘transport’ signals between the two synced machines, such as ‘PLAY’, ‘STOP’ and ‘GO TO BEGINNING’ etc. While this is not ‘essential’ to syncing your two devices together, it’s a nice extra feature that can come in handy, as most MPCs have the ability to receive (and transmit) MMC messages. Now return to the MAIN sequence screen (this is important as with some MPCs, your sequence will not play back if you remain on the MIDI SYNC page). That’s it, all done. In Logic, hit the PLAY button and your MPC sequence ‘1’ should begin playback. Press STOP (or space bar) in Logic, and your MPC should stop. Press Logic’s forward and rewind buttons and you’ll see both Logic and the MPC sequencer forward/rewind by a bar at a time in unison. Your MPC will also ‘adopt’ the tempo of the Logic project as Logic is the MIDI Clock master, so even if the MPC sequence had a tempo of 150 BPM, it will always play back at the 86 BPM of your Logic project. In many MPCs, this will be shown in your MPC sequence, where the tempo parameter will change to read ‘EXT’. If your MPC is not playing back when you hit ‘PLAY’ in Logic, go back through all the above steps and ensure everything has been set correctly. Also, check your MIDI cables and ensure they are plugged all the way into the MIDI ports. If you continue to have problems, quit and restart Logic, as this can sometimes solve random MIDI problems. In chapter 4 of ‘Using Logic Pro With The Akai MPC‘, we’ll look at using MIDI Clock to record MPC MIDI and audio data into Logic, as well as how to handle the common problems that may occur. Thank you so much,I have logic Pro9 and will try this. My question what’s the difference using Pro-tools and Logic. I have been told using Pro-tools is better. It’s Sylvan again forgot to mention I have a MPC 2500. Im using this in my Band playing live. Since I am planning to sync Logic-Pro with my MPC——my question is would it be better to get an MPC5000? Thank you for your quick response. I think I would order the XLCD Screen.How does one go about installing the JJOS Programme? It’s easy, you download it from the JJOS site, transfer to your MPC CF and just load it up and reboot the unit when told onscreen. Full instructions available on the JJ site, but I’m also working on an install guide for mpc-tutor.com. I received your ebook today.Thank you. I’m using an MPC 2500 and a korg keyboard as a sound module.I have a reggae and Soca Band .My goal is to use my MPC to communicate with Logic.I need to use a keyboard in order to play brass lines and play the shuffle (Chords)If I can do this then I would be able to record backup vocals and so on.This is what I really want to accomplish.Really appreciate your help. Hi, all that is covered specifically in chapter 2 of the book, just set everything up as explained there and then plug the Korg keyboard into the MPC MIDI IN and you should be good to go. Thanks Andy.look forward to seeing the new download. Give thanks. Hooking up the midi section of a studio in Jamaica…. old-school style! This was simple, clear and jogged my memory in the right way. Sometimes you just need to be reminded! Big Up and 1 luv! Hey, when I have my mpc2500 slaved via mtc using jjos in logic,it stops when I have a sequence looping. To be more clear I am laying synth midi in logic and doing my drum programming on the 2500. In this case I have logic looping to hear my synths but on the second loop the mpc will stop. With the akai os it doesn’t do this, the drums will keep looping with the logic daw as long as I feel. I prefer the jjos an I never use beat clock cause I loose feeling. Do you know a solution to this so I can get back to using jjos? hi, can someone explain﻿ how to make mpc renaissance a midi slave to other machine or computer? i tried to make it slave to other mac running under logic as also ableton. i tried also with jomox 999 but no luck. i even try to slave it under two logic running on separate mac machines which sync perfect, bur REN as plugin just runs and does not stop or start. i tried everything in my knowledge. the REN sync options are simple but i could not make it run as a slave. is it possible that is some software bug?? thank you for answer in advance..
I’ve not had much opportunity to delve into this aspect of the Ren yet. Have you tried posting this question to the MPC Renaissance forum at my site, MPC-Forums.com? How do i find out which OS or JJ OS am i running? Just go to the OTHER screen (MODE and pad 10) – this will tell you the OS that is running. Hi. Just a quick question. I would like to sync my MPC with Logic, but at the same time control the play, stop and record etc with the MPC’s transport buttons. When syncing MPC2500 with Logic – Will MPC’s transport buttons (play, stop etc) still work or does Logic overwrites this? The MPC can be the syncing ‘master’ with Logic if you use MTC – in which case the MPC transport buttons will control Logic. Hey mate. Thanks for your reply. Can Logic be Slave as well? Thank you very much for you help man. I’ll be purchasing the PDF shorty to try to set this up if this works. Yes, Logic can be slave when using MTC, but not MIDI clock – if using MIDI clock, the MPC has to be slave. Hi man just curious about how do i go about using my MPC Studio that i just bought to trigger the software instruments in Logic9 or Logic X OK I’ve been using Macshine but since i saw some tutorials on line witht he MPC studio i decided to buy it last week and im a long time user of MPC from MPC 60 to my latest was the 4000 which i have now parked at home and not carrying on the road anymore,i want to Program and use the MPC studio in conjunction with Logic 9 and or Pro tools which i will do but i also just want to use the Pads to play Logic9/LogicX sounds/Library instruments eg Drums mostly and samples cause I’m a drummer/Producer and i do lots of Percussion and sound design work in my Production studio and i prefer the feel of MPC pads from years now… i connected the MPC to my Laptop and started Logic but the pads were not getting the sounds it was the Buttons on the MPC that were playing the logic sounds so i wondering if there’s a way to get the PADs to be triggering the sounds instead of the Buttons from the MPC studio please assist me with ur vast knowledge here and i promise U Backstage passes at teh next Ky-Mani Marley concert that comes to your town or Maxi Priest /Big Mountain/Diana King ok thanks man looking forward to hearing from you im on tour in Europe now and i have so much to do and i didn’t bring my Maschine so hense my needing to sort this out while im here ok !!! Yo i got my mpc synced up to logic via an interface I’m using jjos1 and when i record into logic through the external inst it records the notes but doesn’t playback any sound? And can i record my beats in my mpc directly as audio via my interface or do i have to record midi first and then bounce? Hi I have followed all the steps and it is still not working. I have an MPC500 and have it connected to my iMac via a MIDI Audio interface. I am using the logic template given in this tutorial video: https://www.youtube.com/watch?v=0m0UF9ALnbQ and basically when I hit play on the MPC or Logic all the sounds show up on the level bar for each one as they are hit, so i know that logic recognises my MPC but logic makes really unusual sounds for each one and doesn’t actually play any sample thats coming from the MPC. When I hit record nothing is recorded either. Also I can not record via Line-in because I own a new mac that doesn’t let you do this. If anyone has any advice and can help me out in anyway at all it would be really appreciated. This is so frustrating! Cheers, Jake. My mpc 4000 don’t sync well in logic x like my 5000, I have to move it to the grid. Is there a better sync program to to connect? Surprising, as the MPC5000 is said to have the poorest MIDI syncing performance of all MPCs and I’ve not heard of any particular issues with the 4000 and Logic. Hi, a quick question before buying your book, which looks very interesting – if its in the same vein as the above sample article. However, before buying it I’d like to ask if your book will be okay to use with Logic 8 and an mpc1000? I understand that there will be some differences, but I imagine that most of the stuff still applies? I had the same thing with a Supercollider book which was also about Logic Pro and SC. I could use most of the book, but occasionally you realise that there’s a pull down window, or plug-in, that isn’t so compatible with the tutorial, however the rest was exactly the same. Hi, yes it will be fine with Logic 8, there will be some cosmetic differences in the GUI but the settings will all be the same. Everything seems to work fine – according to the above explanation – however, there’s a little confusion as to where the sound of everything should be coming from! At present I have the midi in/out going to my Presonus Firebox (and of course to Logic via firewire), but my mpc audio out is sent to to my amplifier. The midi is working fine, meaning that the mpc and logic happily play away together, except the drums come out of the amp speakers and the project from firebox (headphones at present). Could you kindly outline where the out of the mpc should go and of course should I be able to hear the drums in the Logic project – I guess not as its only midi-synced and the sound is .wav. Thanks again – I guess this is all explained in your book, but it might be helpful to clarify this small, but important detail in you text above. p.s. I know you have another tutorial on midi-mpc (http://www.mpc-tutor.com/understanding-midi-on-the-akai-mpc/#handshake) but of course it doesn’t mention the problem of sound, only the midi syncing. Maybe I’ve misunderstood something? Just bought your book which clearly explains the above question. However, I think it might be a good idea to add a short explanation in your edited tutorial above, this way people won’t be surprised by the results. Thanks – by the way the book looks very interesting. Hi, I bought your book which is very interesting – as mentioned in my comment above. However, one thing I’d be interested to know is how to create a ‘Blank.prg’ file? In your tutorials (in the book) you explain how we need this file to make the midi layout of the pads to be assigned correctly. Unfortunately you don’t explain how to do this, or maybe I misunderstood something in the book. Could you explain how we do this, or maybe its as simple as assigning a program with nothing in it (and simply calling it BLANK)? Thanks, since I don’t need a book on ‘Beat Making’ it looks as though I’m out of luck. Maybe you could include the explanation in the next edition of your mpc/logic book, after all it deserves to be there also – since it’s part of the same problem – I would think! I’ve already made the chromatic template for you so you don’t actually need to know how to make one; there’s only one type of template you need in this book and its there for you to load up whenever you need it. But for the purpose of the logic book there’s no need to know any of this, you just need a quick way to get chromatic pads, which you do by loading up the provided chromatic blank program. Thanks for the reply, that looks very useful, brilliant. Do you give sent again? You can log into your File Bank at https://www.mpc-samples.com/customer.php and re-download all your previous purchases. If you’ve forgotten your password you can request a new one from the login page. I have tried this process forwards and backwards. I can not get my MPC 4000 to send or receive midi between Logic Pro X. Does anyone have any suggestions. Hi, this might be a funny question but can MPC software (the one that comes with the Ren) be used via midi with the MPC3000? I have the Ren have to sell it and would rather keep my 3000 since it is my baby. If so, do you plan on making a tutorial for this install/connect?